James Burtons' concept for St Leonards was strongly influenced by his involvement with Nash in Regent's Park. Central to his vision was the picturesque siting of villas amongst the groves and wooded slopes of the surrounding landscape. James Burton designed St Leonards Gardens in 1828, a green heart for his new seaside resort set in a valley, amongst picturesque villas and reflecting a unique Regency style. Originally just for wealthy subscribers, the Hastings Corporation bought the gardens in 1880 and opened them to the general public. 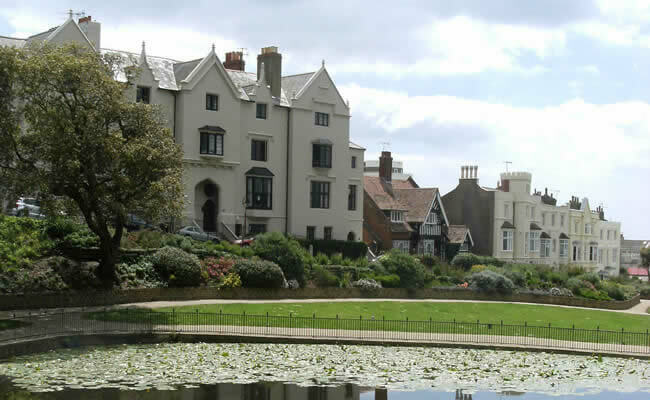 Recently renovated with the aid of a Heritage Lottery Fund grant, the Gardens today offer a tranquil oasis in the Maze Hill area of St Leonards, with views to the sea. The scheme has been designed to provide colour all year round with a mixture of herbaceous plants, shrubs, bulbs and trees clustered together. A central feature is the ornamental pond with water lilies. The park is also rich with wildlife. The villas surrounding the gardens, in Regency Gothic and cottage styles, were integral elements of the landscape, with key buildings such as Allegria Court, Gloucester Lodge and the Clock House, still prominent within the gardens. Many well-known people have been linked to the gardens, including the young Princess Victoria, the writer Rider Haggard (King Solomon's Mines) who lived in the North Lodge and various distinguished visitors including Rudyard Kipling. The main entrance from Maze Hill has good disabled access and the paths are gently sloping to just past the pond. The rest of the site has steep slopes and steps. Small 14,000 square metres formal garden with undulating topography affording good views of the site as well as surrounding historically important architecture. There is a dogs on lead byelaw enforced between 9am - 6pm. 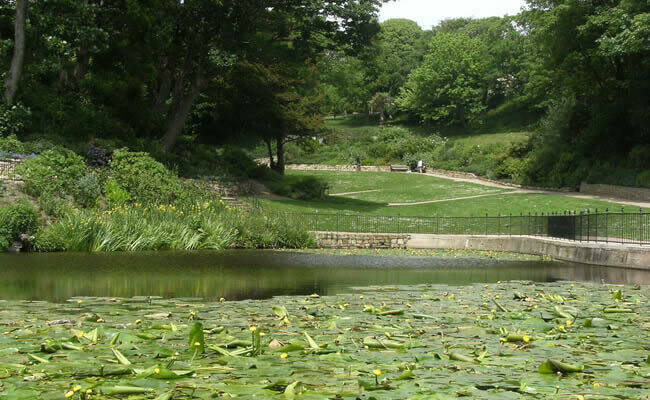 St Leonards Gardens achieved its first Green Flag Award in 2009 and we continue to retain this status.